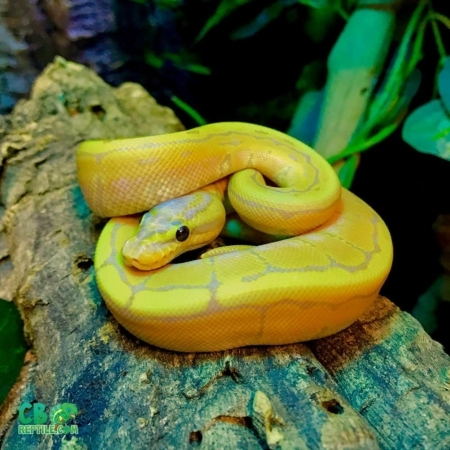 We have some absolutely stunning Banana pastel pythons for sale. All of our pythons for sale online are 100% captive bred. 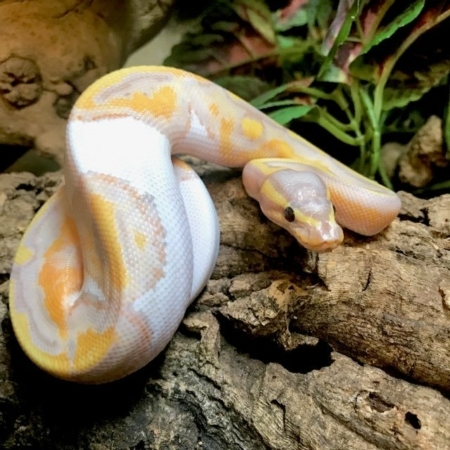 Our captive bred baby banana pastel ball python for sale are bred for vivid color and fed a top quality diet to ensure proper growth, raised with the proper humidity, and handled often our banana pastel ball pythons for sale are some of the most docile and friendliest ball pythons for sale online anywhere! The banana pastel ball python (Python regius) is a good snake for a beginning snake owner. Growing to a maximum size of 3 to 5 feet, ball pythons are not as large as many of the other constricting snakes that are kept as pets, are quite docile, and are easy to handle. Banana pastel ball python morphs are so named because when threatened they roll themselves into a tight ball, tucking their head inside their coils. Baby ball pythons grow about a foot a year for three years. They can live for a long time with proper care (up to about 50 years although 20 to 30 appears to be more typical). When choosing any snake for sale, be sure to choose the right ball python breeders, who work with only 100% captive bred baby ball pythons, and do not condone, sell or work with wild caught animals. Our captive bred baby ball pythons are available as hatchling, well started baby, and juvenile ball pythons for sale. With a BIOLOGIST ON-SITE, all of our baby banana ball python for sale online come with our full live arrival and 7 day health guarantee. We ship via ups or fedex in heated or cooled insulated shipping containers via overnight with early morning arrival. One shipping charge covers up to 4 ball pythons for sale. With a Biologist ON SITE, shop with confidence that each baby albino ball python for sale comes with our full live arrival and 7 day health guarantee! When considering a ball pythons for sale online or at a pet store, PLEASE make sure you are only purchasing a captive bred python for sale and not a wild caught specimen. We are proud ball python breeders and invite you to take a moment to visit our ball python care sheet and our ball python morphs for sale section. At CBreptile.com, we ONLY work with 100% captive bred reptiles for sale online and do not carry ANY wild caught also known as “field collected” animals. We guarantee you 100% healthy pet ball pythons for sale 100% of the time and offer free lifetime support for any questions our customers may have concerning proper care of their new pet albino ball pythons for sale. Looking for a spectacular banana pastel ball python for sale? 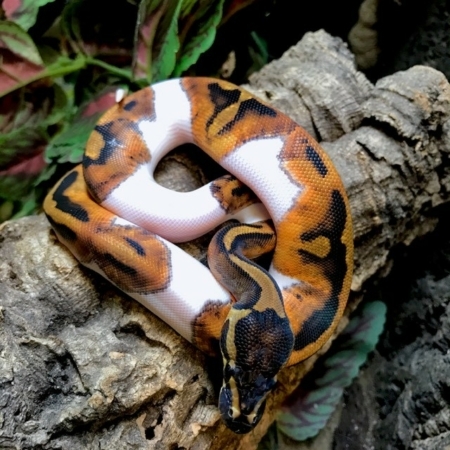 CB Reptile has the nicest captive bred baby ball python for sale online anywhere! Countless amazingly stunning ball python morphs. 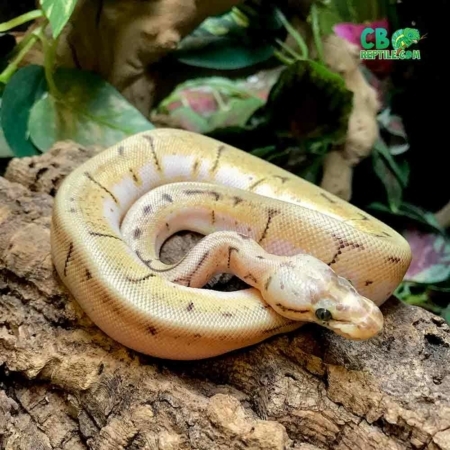 CB Reptile has some fantastic ball pythons for sale online including pied ball python for sale, albino ball python for sale, pastel ball python for sale, albino enchi ball python for sale. Most notably, we’ve got a real a Biologist ON SITE! Because of this you can shop with confidence that each baby ball python for sale comes with our full live arrival and 7-day health guarantee! In contrast, when considering a ball python for sale online or at a pet store, PLEASE make sure you are only purchasing a captive bred python for sale and not a wild caught specimen. Most noteworthy, at CB reptile we ONLY work with 100% captive bred reptiles for sale online and do not carry ANY wild caught also known as “field collected” animals. Secondly, we guarantee you a healthy pet ball python for sale 100% of the time and offer free lifetime support. Lastly, we are here for you! Because of our customer service never neds, feel free to ask any questions concerning proper care of their new pet ball pythons for sale. As a result of decades of captive breeding, we have some absolutely stunning baby ball pythons for sale. Above all, 100% of the ball pythons for sale online at CB Reptile are captive bred. Consequently, our captive bred baby ball python for sale are bred for vivid color and fed a top quality diet to ensure proper growth. As a result, our balls are raised with the proper humidity and handled often. While our baby pastel ball pythons for sale are some of the most docile and friendliest ball pythons for sale online anywhere! Another reason the baby ball pythons for sale (Python regius) are good snakes for a beginning snake owner is size. Because they only grow to a maximum size of 3 to 5 feet, ball pythons are not as large as many of the other constricting snakes. As a result ball pythons can make excellent pets, are quite docile, and are easy to handle. Ball pythons were first named “ball” because when threatened they roll themselves into a tight ball, tucking their head inside their coils. Because of this, when choosing any snake for sale, be sure to choose the right ball python breeders. Similarly, choose those who work with only 100% captive bred baby ball pythons, and do not condone, sell or work with wild caught animals. Above all, our captive bred baby ball pythons are available as a hatchling, well-started baby, and juvenile ball pythons for sale. Because we have a real BIOLOGIST ON-SITE, all of our baby ball pythons for sale online come with our full live arrival and 7-day health guarantee. Lastly, CB Reptile ships via ups or FedEx in heated or cooled insulated shipping containers via overnight with early morning arrival. Even more of a reason to buy more than one snake is that our shipping charge covers up to 4 ball pythons for sale. CB REPTILE HAS THE NICEST BALL PYTHONS FOR SALE ANYWHERE! We have some fantastic ball pythons for sale online including pie ball python for sale, albino ball pythons for sale, piebald python for sale, albino enchi ball python for sale. We have a wide variety of ball python morphs for sale mostly baby ball pythons for sale as well as well started babies, juveniles and young adults. Our selection of captive bred ball pythons includes, but is not limited to: banana ball python, banana pastel ball python, spinner ball python albino ball python for sale, , yellow belly ball python for sale, pied bald ball python for sale, piebald python for sale, pastel ball python for sale, honeybee ball python for sale, banana ball python for sale, blue eyed leucistic ball python. SHOP FOR YOUR BABY BALL PYTHON FOR SALE WITH CONFIDENCE AT CB REPTILE! With a Biologist ON SITE, shop with confidence that each baby albino ball python for sale comes with our full live arrival and 7-day health guarantee! When considering a ball pythons for sale online or at a pet store, PLEASE make sure you are only purchasing a captive bred python for sale and not a wild caught specimen. We are proud ball python breeders and invite you to take a moment to visit our ball python care sheet and our ball python morphs for sale section. At CBreptile.com, we ONLY work with 100% captive bred reptiles for sale online and do not carry ANY wild caught also known as “field collected” animals. We guarantee you 100% healthy pet ball pythons for sale 100% of the time and offer free lifetime support for any questions our customers may have concerning proper care of their new pet albino ball pythons for sale.